When approaching Elkhart, Indiana, from the east on US Highway 120, you will pass modest ranch houses situated on large plots of land, a handful of auto service shops, and a good number of churches. After you pass through Bristol, the highway lines up with the St. Joseph River. The houses become increasingly bigger and nicer, with expansive and well-manicured lawns that back up right to the river; most of these properties have docks and boats. 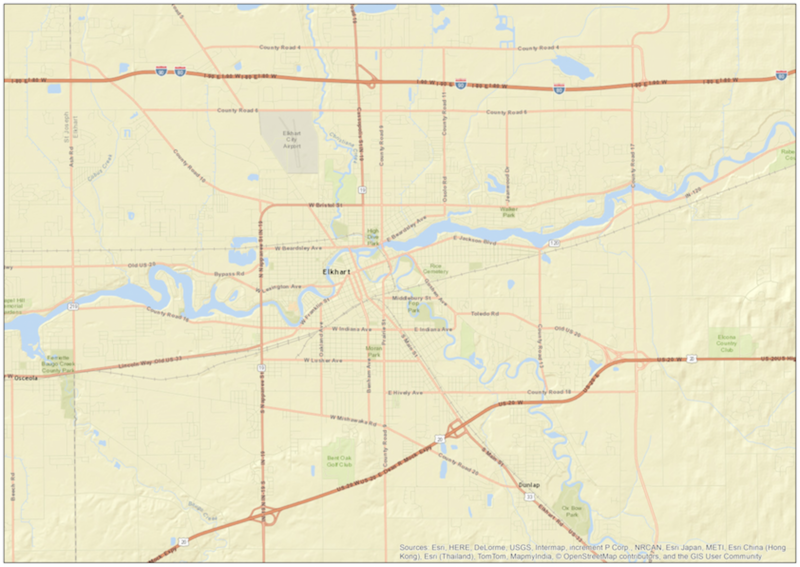 Although South Bend and Notre Dame University are located only fifteen miles to the west, Elkhart is remote from major cities and is surrounded by farmland. It has a population of about 50,000 and has a “small town” sensibility. The town is known for manufacturing mobile homes, recreational vehicles, and musical instruments. For most of its history, Elkhart has largely been working class and what the U.S. Census has defined as “white” and “non-Latino.” But over the last several decades, a significant number of Hispanic and/or Latina/o people have moved into the area, as indicated by U.S. Census data. This made Elkhart an excellent site for my project to map “entertainment retail” sites in towns in the American Midwest that have significant populations of racial or ethnic minorities. 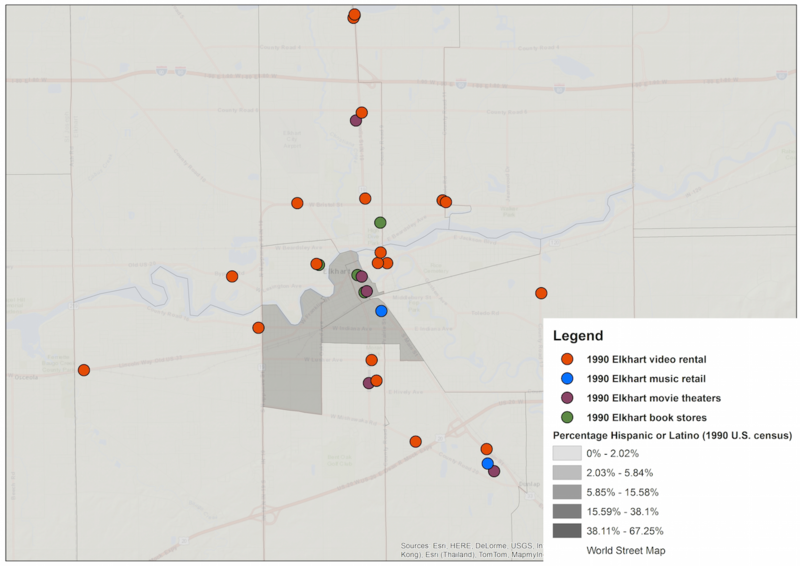 Thus I have mapped all the video stores, record stores, bookstores, and movie theaters in Elkhart from 1980 to the present. Although I have a range of different questions and goals related to this project, it is propelled most basically by my interest in seeing if there is any relationship between the changing demographic composition of this town and the location and number of these retail sites and, if so, to see if that relationship can be visualized with maps. 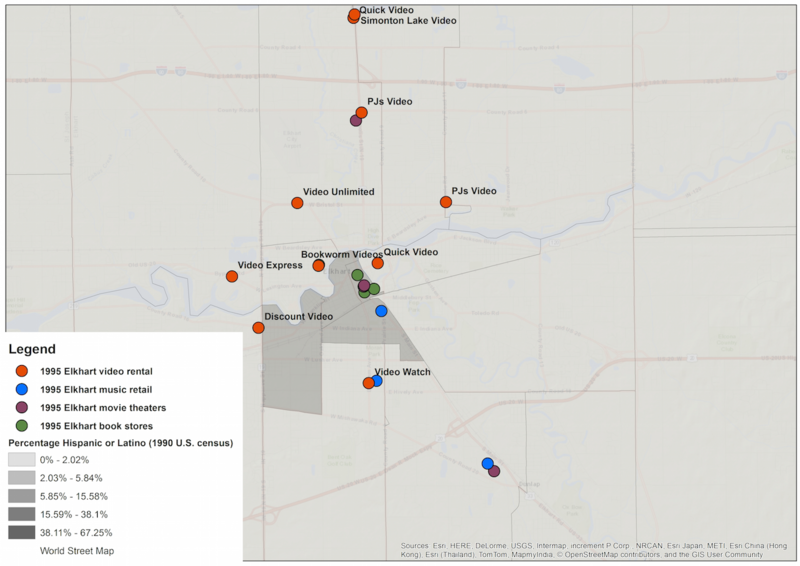 This map (figure 2) displays all the entertainment retail sites in Elkhart in 1980. We see a clustering of locations in the downtown area, primarily made up of movie theaters and music shops. Despite the fact that the 1980 Directory had no “Video Rental” category, we see a site that likely sold and perhaps rented videotapes—an adult movie store that was listed as a bookstore. Outside this cluster, the map indicates something of a commercial corridor heading to the southeast, toward the town of Goshen, which lies just beyond the border of this map. 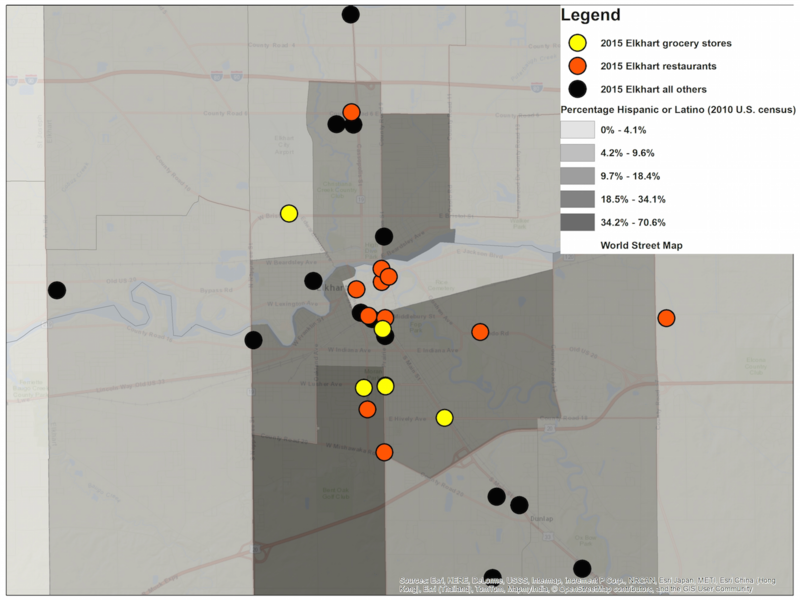 The map also shows that Elkhart is overwhelmingly made up of white people; there is a small African American community in the downtown neighborhood. 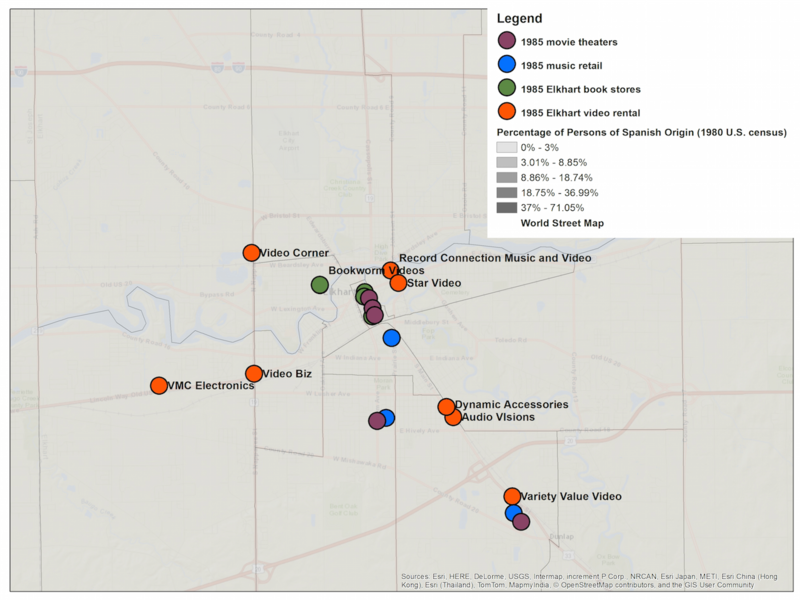 The following maps display the absence of Latina/os in Elkhart during the 1980s. The second map (figure 4), from 1985, shows a rather impressive number of video stores. As in many other places, the video stores in Elkhart are dispersed in a relatively decentralized manner, indicating that these places provided geographically convenient access to an array of movie choices and thereby helped to “localize” movie culture. As seen in this map (figure 5), the number of video stores in 1990 is even more remarkable. The stores appear evenly dispersed across the entire town, almost equidistant from one another. Additionally, this map indicates a slight increase in the percentage of Latina/os in the area. 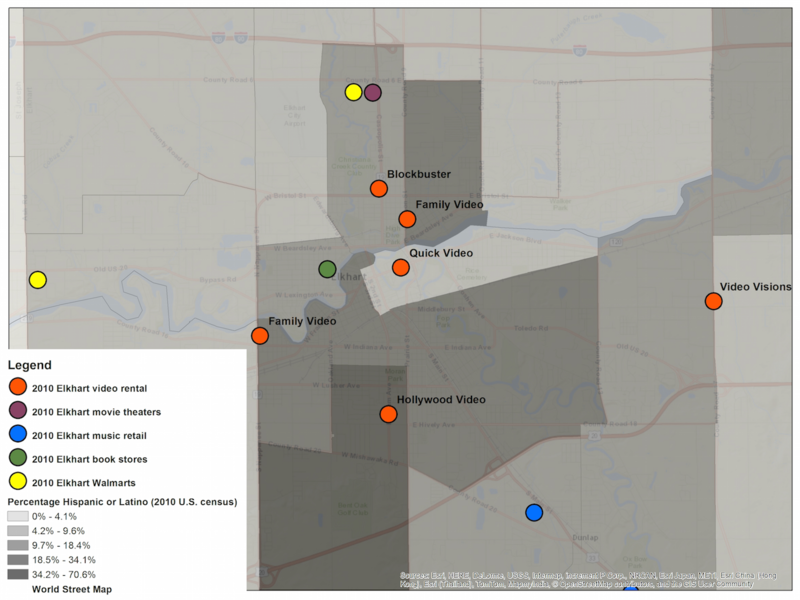 It also shows that this group was primarily living in the center of the town, and that the video stores are distinctly not located in the downtown or Latina/o areas. Moving forward in time to 1995 (figure 6), we see a reduction in the number of entertainment retail sites, although a good number of video stores remain. And in both 2000 and 2005 (figures 7 and 8), there has been an even greater increase in the percentage of Latina/os in the area. Aside from the video stores, which continue to be located outside the downtown area, there has been a significant drop in the number of entertainment retail sites—only one movie theater remains. 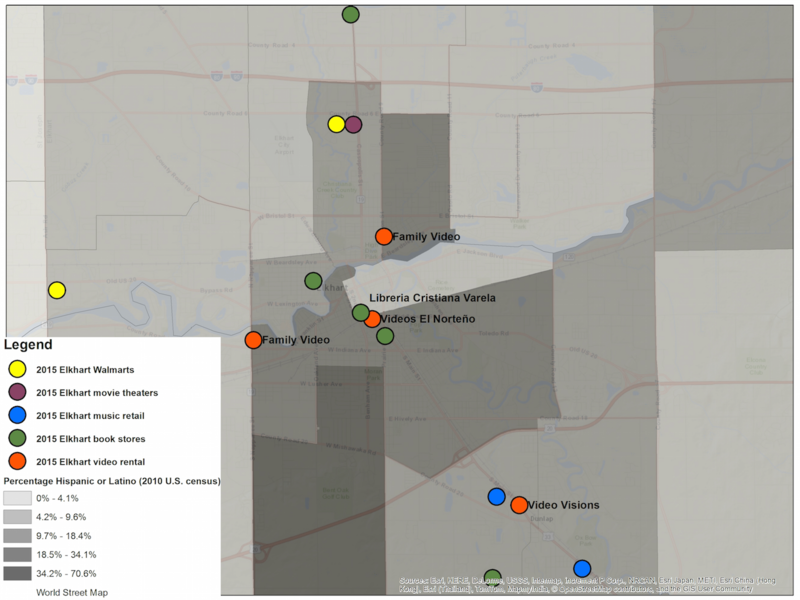 In fact, there seems to be a virtual elimination of entertainment retail from Elkhart’s downtown and, moreover, there appears to be a slight negative correlation between the location of Latina/os and entertainment retail sites. 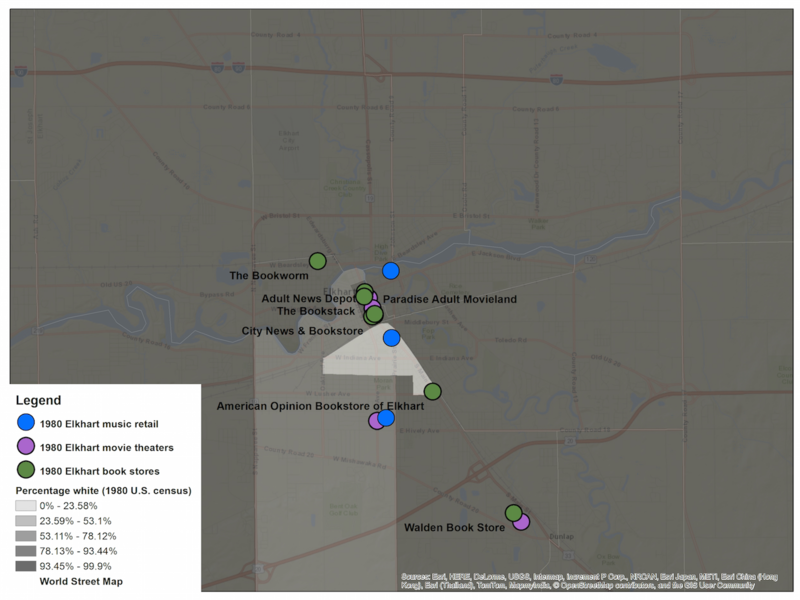 These maps also include a Wal-Mart that was open in the area at the time, which of course sold books, music, and DVDs. It is likely that, along with online retailers, this Wal-Mart lured customers away from the other stores. Perhaps predictably, by 2010 (figure 9) we see a reduction the number of video stores, while only two record shops, one movie theater, and one bookstore remain. Another Wal-Mart has been opened on the western edge of town. There is now a considerable Latina/o population in and around Elkhart, and this group no longer appears clustered in the center of town. Importantly for my project, the map does not indicate any relationship between the residence of Latina/os and entertainment retail. However, it seemed likely to me that the Latina/o population must have affected the commercial environment in Elkhart in some way. 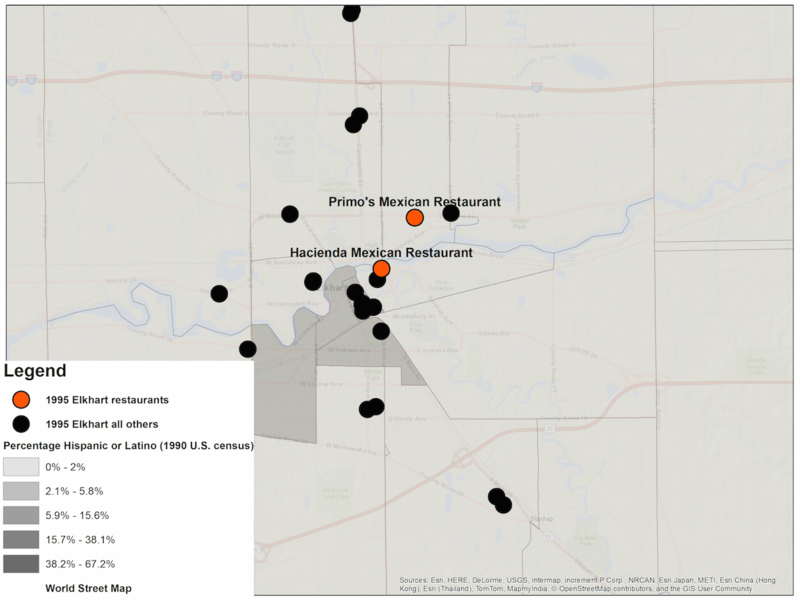 In order to confirm this, and to reaffirm the lack of correlation between the Latina/o population and the location of entertainment retail stores, I also gathered the addresses for all restaurants and grocery stores that had Spanish names or otherwise indicated that they were owned by Latina/os. The following map (figure 10) shows all entertainment retail sites in black and shows the restaurants in red. There were no Latina/o grocery stores and only two Mexican restaurants; one of them, Hacienda, is part of a regional chain. There is nothing remarkable about their placement within the town, other than that they are closer to downtown whereas the entertainment retail sites are more dispersed. By 2015, we see a very different landscape. Now, we see eleven restaurants and five grocery stores. Unlike the entertainment locations, both the restaurants and the grocery stores are clustered in or near downtown. 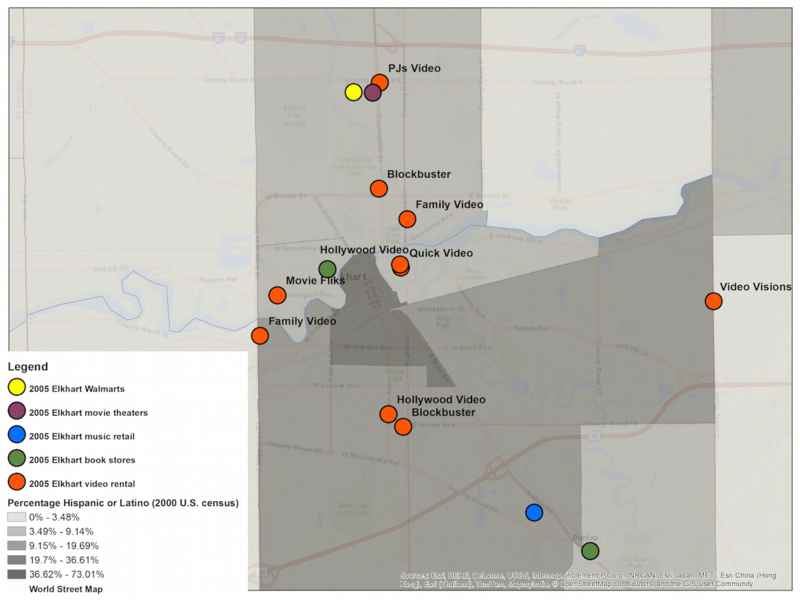 Although there is no clear or dramatic correlation between their placement and the Latina/o areas, these sites appear slightly more aligned with the Latina/o population than the entertainment sites. 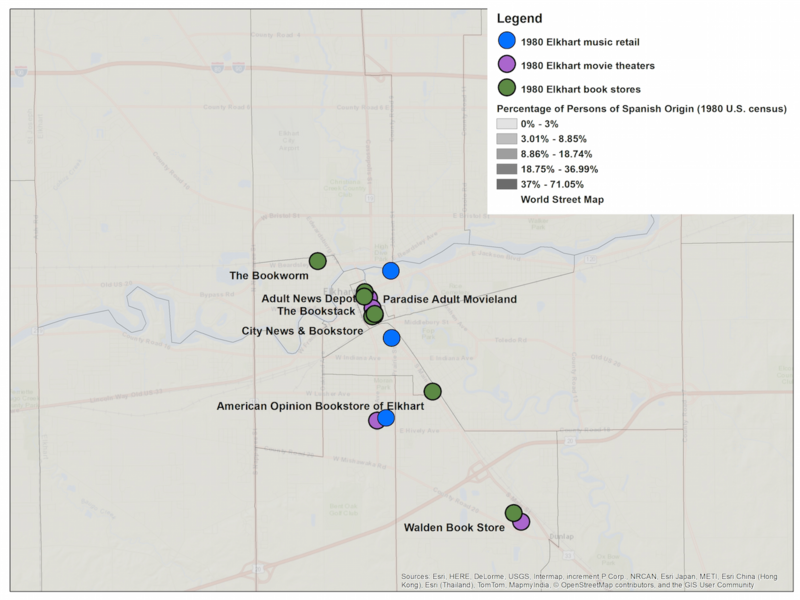 In any case, we see that the demographic changes in Elkhart’s population did, in fact, impact the commercial landscape, but not so much in the form of video stores, book stores, etc. Consequently, I phoned all these locations and asked if they rented or sold movies or if they ever had. I admit I was surprised when only one storeowner indicated having done so; she said they stopped selling movies about eight years earlier. I then asked a research assistant to call these locations and, speaking Spanish, ask where one could find Spanish-language media. 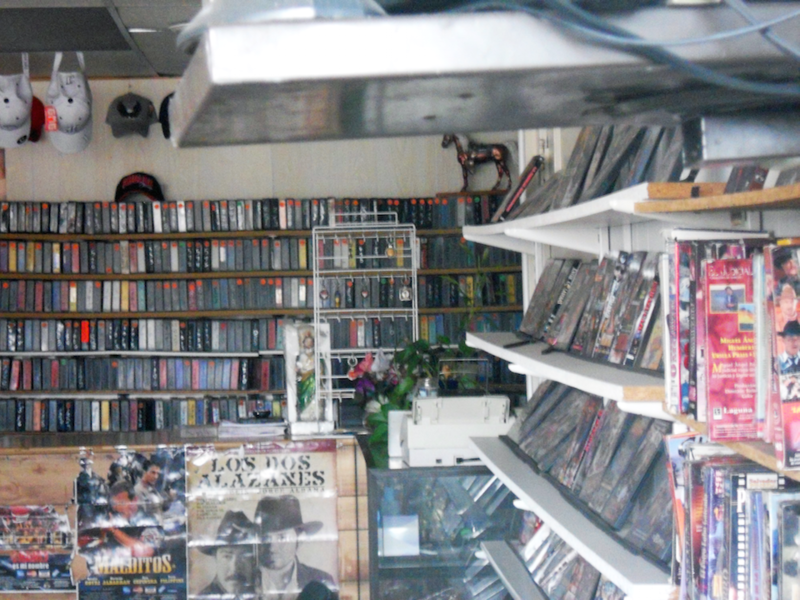 Many storeowners answered “Wal-Mart” or “the internet” or “piracy.” We were surprised, however, to have a restaurant owner indicate that there was a video store that specialized in Mexican cinema. Using this restaurant owner’s somewhat inaccurate directions and Google Maps “street view,” I located Videos El Norteno in downtown Elkhart. 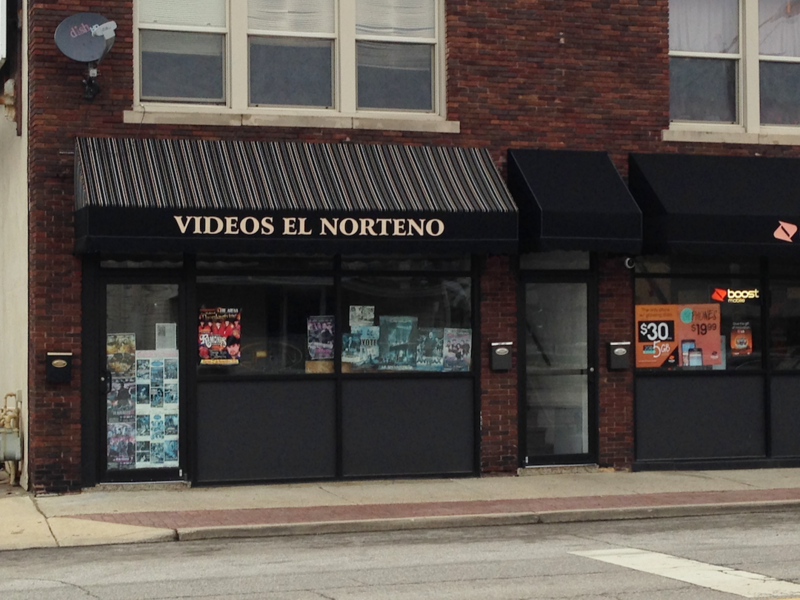 I have been unable to speak with the owners of Videos El Norteno, but these pictures (figure 12 and 13) taken by a research assistant while the store was closed, indicate that, indeed, there is a video store in Elkhart that is dedicated to Spanish-language movies. 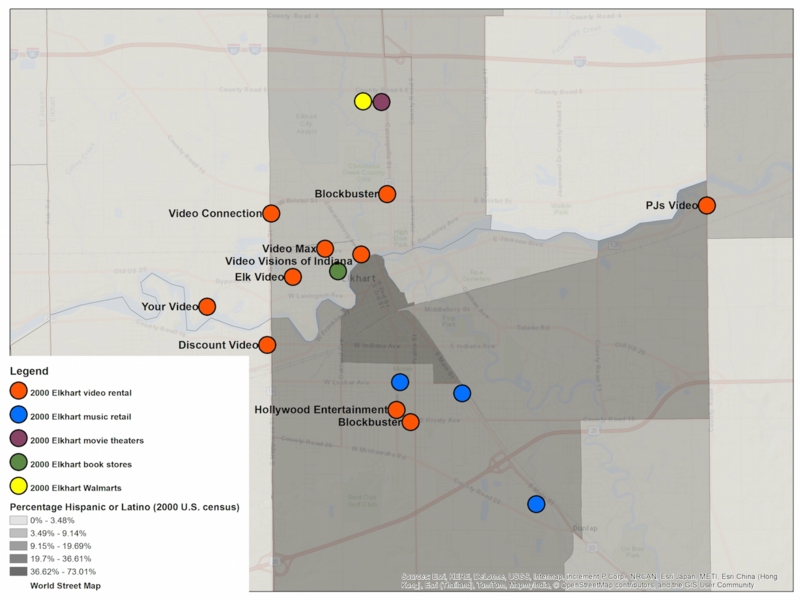 And so the most accurate, current map of entertainment retail in Elkhart looks like this (figure 14). Instead of any conclusions, I want to offer a few observations about these maps and the research that generated them. First, although they may serve as essential resources, one cannot rely upon city directories for complete listings of a town’s businesses. Maps generated from these sources may be comprehensive and accurate, but they may not. For the researcher, this suggests that we need to draw from multiple sources for information, including fieldwork and interviews, in order to map the ways that people and commodities occupy, move through, and intersect within specific places. Second, research conducted along these lines should anticipate that media commodities do not flow through conventionally defined venues. Although this may be readily known to some, the fact that videos can be found at bookstores, grocery stores, and restaurants should make researchers more creative in where we look for media. Third and finally (for now), the town of Elkhart suggests that different immigrant populations can impact local areas and conditions in diverse ways. Although there are many Spanish-named grocery stores and Mexican restaurants in Elkhart, the local Latina/o population does not appear to have significantly affected the entertainment retail offerings. This differs, for instance, from Dearborn, where Arab Americans appear to have used video rental stores as a means of formulating a local and transnational media culture. My point is, and I do not mean to be offensively obvious here, that there is no uniform way in which diasporic communities manifest themselves, culturally and commercially, within a specific area. We’ll see this again, and differently, next time in Minneapolis and St. Paul. This work was supported by a grant distributed through the Humanities Without Walls consortium “Global Midwest” initiative and administered through Purdue University; many thanks to Kathryn Brownell who was PI on the grant. HWW is a Mellon-funded initiative under the leadership of Dianne Harris of the Illinois Program for Research in the Humanities at the University of Illinois at Urbana-Champaign. I am grateful to Renee Gaarder at Purdue and Orquidea Morales at the University of Michigan for their excellent research assistance (and detective work). Thanks once again to Ben Strassfeld for making the maps. And finally, many thanks to Orquidea Morales, Yuki Nakayama, and Colin Gunckel for their feedback about this essay.